Starting your new education career can be daunting as well as exciting. Those last few days of setting up your new classroom before your first set of students appear can also be overwhelming as there is so much to do! With this easy-to-use New Teacher Checklist, you can ensure that you have everything you need and no detail has been forgotten. This checklist breaks down the different areas that can help any new teacher start their first year of teaching off right. From a survival kit through to the big first day, this checklist covers all the key moments you will need. This checklist template has been created to cover all the basic areas that will help you start your year off on the right foot. This checklist can also be customized to include any needs or ideas that are specific to a teacher, school, or specialty. You can add a section to include any personal shopping that may need to be done before the first day of school such as new clothing. As the summer begins to wind down, you will be thrust into meetings and planning sessions before the students arrive. As you begin to navigate through your first few weeks of set up, it can be easy to forget the details. This checklist will help keep everything on track and set you up for a successful first year of teaching. 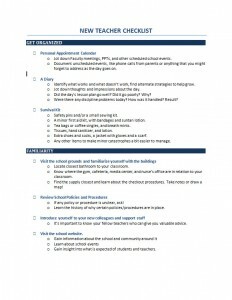 Download the checklist today, customize it if needed, and give yourself the best setup for the beginning of a great teaching career.